Lucky participants have the amazing opportunity to work with either 2 or 4 Top Bi-Coastal Talent Agents in either a 1/2 day workshop or a full day 6.5 hour workshop! We are bringing in four David Doan of CESD, Bonnie Shumofsky Bloom of Stewart Talent in the AM workshop and Mallory Levy of DDO and Victoria Kress of Abrams Artists in the PM workshop. The agents represent kids and young adults for theatre, film, TV, commercials and voice-over! These Agents are always looking for talent and many students have been picked up from classes and are now working! (Read about our student’s successes on our Student Achievements Page! • Perform either a one minute monologue OR a 16-bar cut. A music director will be provided for singers. Monologues will be sent in advance for straight actors. • Actors will receive one-on-one coaching on their presentation, interpretation and audition technique from both Victoria and Mallory! Learn how to snag an Agent and how to nail auditions! 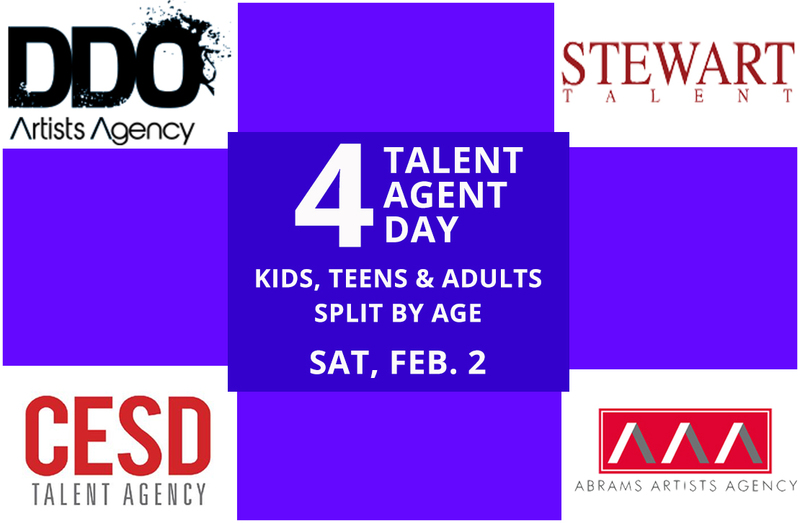 Agents: Victoria Kress of Abrams Artists, Mallory Levy of DDO, David Doan of CESD and Bonnie Shumofsky Bloom of Stewart Talent!